A record of my struggle to answer the big question "How do you work these dang paints?" You'll find sketches and studies in oil, pastel, color pencil, pencil, and ink. I welcome comments, inquiries, and of course purchases. 7 x 5 inches, oil on board. A final bouquet of flowers from our garden this year, set in front of a curtained window. Painting it was a rollercoaster ride of lighting effects as the weather bounced back and forth between cloudy and sunbreaks. 5 x 7 inches, oil on board. 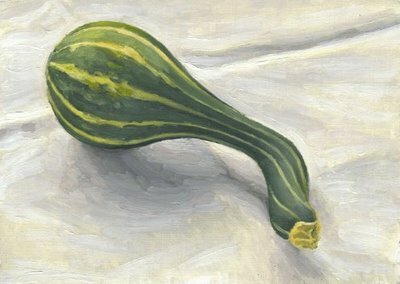 Yet another gourd...but this one is sort of elegant. There are more coming: warty, psychedelic ones. 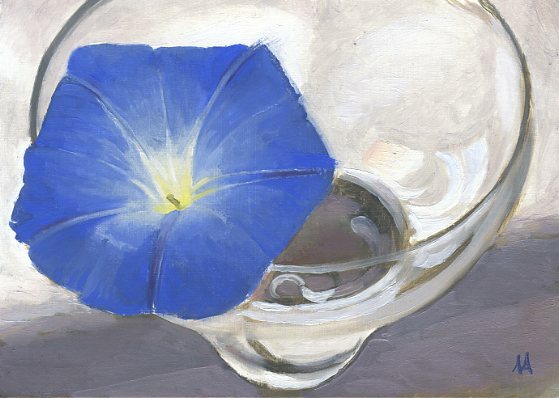 I'd like to continue painting these incredible flowers. They're still blooming prolifically but temperatures have dropped into the low 40's at night, so I guess I should hurry. I could work with a photo, I suppose, but given the choice I prefer to be lookin' at the real thing. I don't think that's a vase, I think it's a little urn for sake. I need to get some sake and try it out. I've never seen a yellow eggplant before, but they're out there. Kay's been making and selling pies at an organic farmers' market near here. We've been getting great produce, and also I've been finding some great squash and gourds to paint. And this eggplant. Today I found some really scary looking gourds which I'm going to try painting. Perfect for Halloween. 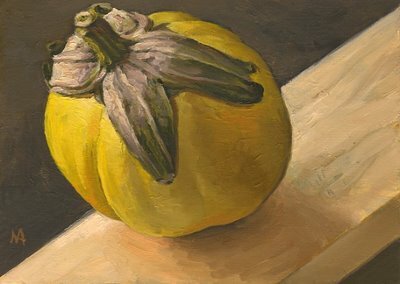 I can see myself doing a whole series of squash and gourds...but I'm sure I'll get distracted by something else soon enough. 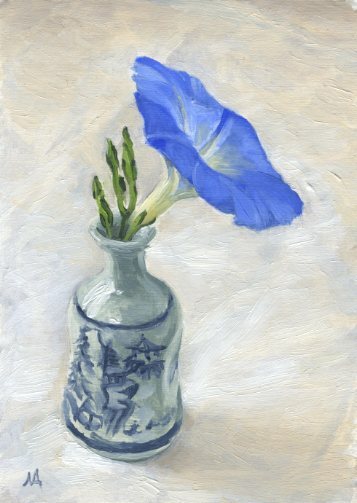 5 x 8 inches, oil on board. 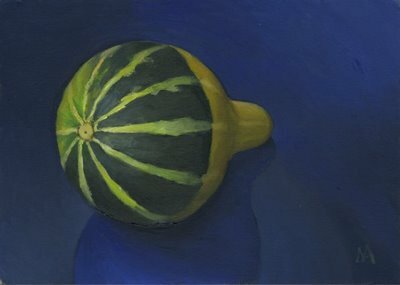 If sunlight is music, and it very well could be, then this highly decorated squash is risking significant hearing loss. I've wanted to grow and paint these morning glories for over a decade. Kay must have several green thumbs because the seeds she planted last spring have taken over several fences and covered them with flowers. They're called Heavenly Blue. Unless we get a freeze in the next day or so I hope to paint these again. Unless stated otherwise, all works are for sale. They may have a PayPal purchase button, or eBay link next to them. PayPal is a secure and easy way to send and receive payments online. Click here for more information about PayPal. Please email me for more information. 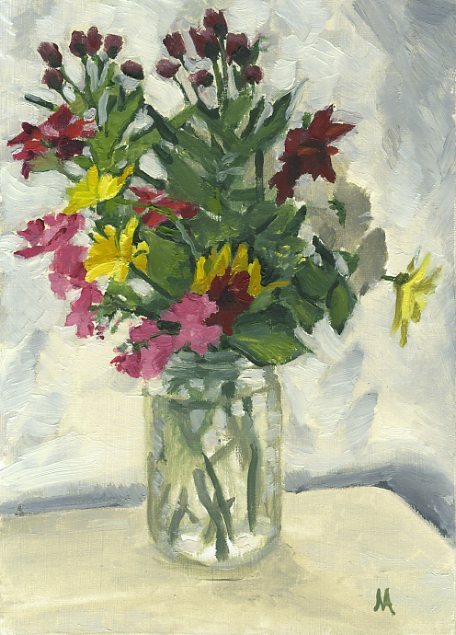 Most of the work on this site are small-format oil paintings, 5 x 7 inches and up. They are a great daily practice and a good way to experiment with different techniques, tools, and media.